* Bought for USD 35 + USD 12 for postage. 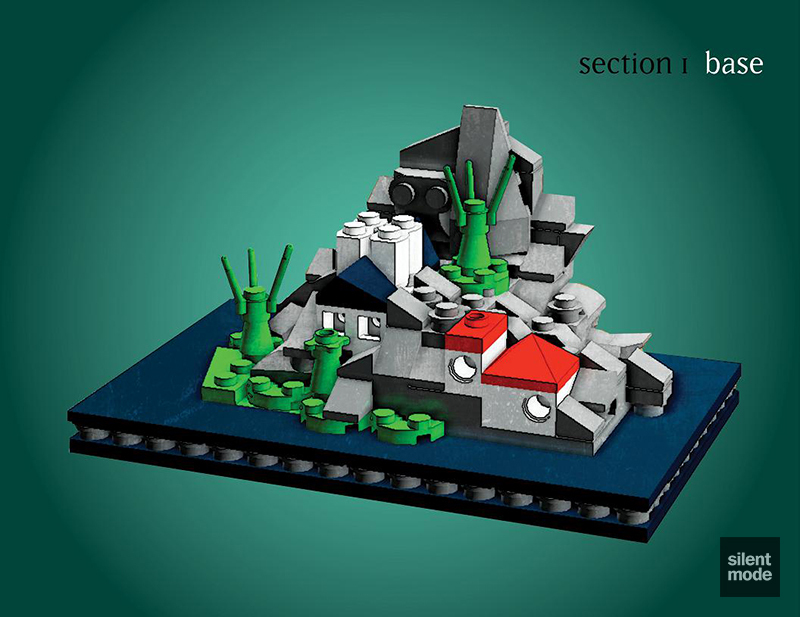 There were a few LEGO-related Kickstarter projects at the time the one for Project Swapfig was launched, and while it failed there were others that succeeded with a landslide victory. 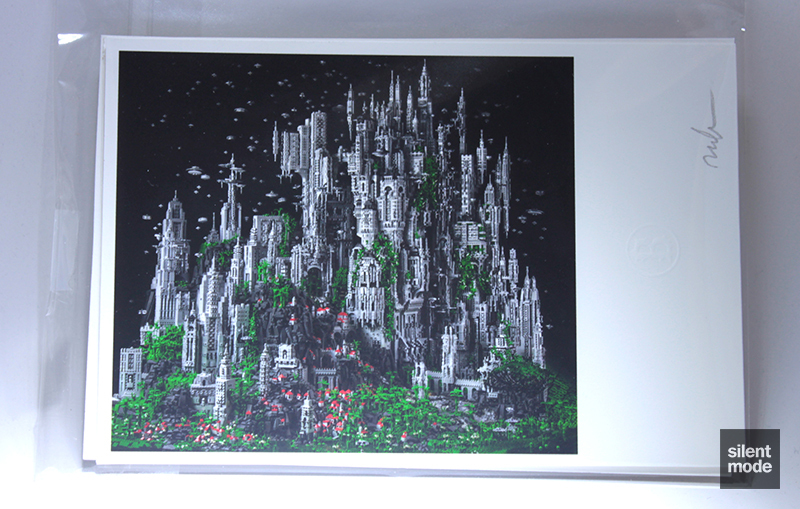 One of these was for CONTACT 1: an artistic project by Mike Doyle over in the States, featuring a 200,000-piece LEGO model. His project managed to raise nine (almost ten) times the target amount, and the model itself was very highly circulated over the Net, including by Rebrick if I remember correctly. If you haven’t heard of Mike Doyle, you’re more than likely familiar with his Victorian house built entirely out of LEGO, which also got the prominent bloggers and forum posters in automatic promotion mode. As a little birthday present for myself, I backed the project with about $50: this got me a small print of CONTACT 1, as well as the parts and pieces to build one of the limited edition models on offer. 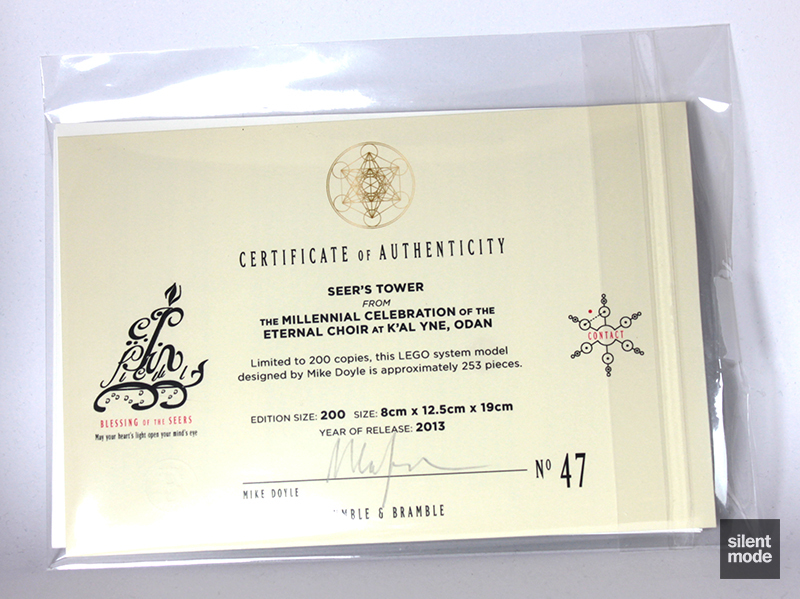 The one I chose is called TEL ENAN – Seer’s Meditation Tower, and was the smallest of the kits available. The opening couple of paragraphs to the story behind the original CONTACT 1 project are here; to read the rest of it visit the ended Kickstarter project page. This is a story where human consciousness rediscovers the art of intuition and the subtle – but powerful – forces of the universe. Here, groups of modern humans use ancient rituals which – in combination with expanded consciousness – initiates communication with the great space faring cultures of the universe. Vectoring extraterrestrial beings to their position on earth, these humans invite the visitors to help heal the planet through the ETs’ transformative powers and bring the greater Earth community closer to the spiritual nature of the universe. One of the things that made this project so appealing was the storyline behind the giant model. While most people are blinded by the size, number of parts and all kinds of other populist things, I’m more interested in how and why a design comes together – and that’s what make something postworthy in my book. Mike had posted my kit on July 2nd, and somehow it arrived on my doorstep three days later. It was packaged as just about any small package would be, but the main thing is that it got here in one piece. You may not be able to see it in this photo, but the card the picture is printed on is embossed on the right with a “B”: the logo for Bumble and Bramble, who did the printing. You can also see Mike’s signature in the top right corner. On the flip side of the plastic envelope the print comes in is a certificate of authenticity, which mentions that this set is limited edition (only 200 of them were put together as a result of the Kickstarter project). 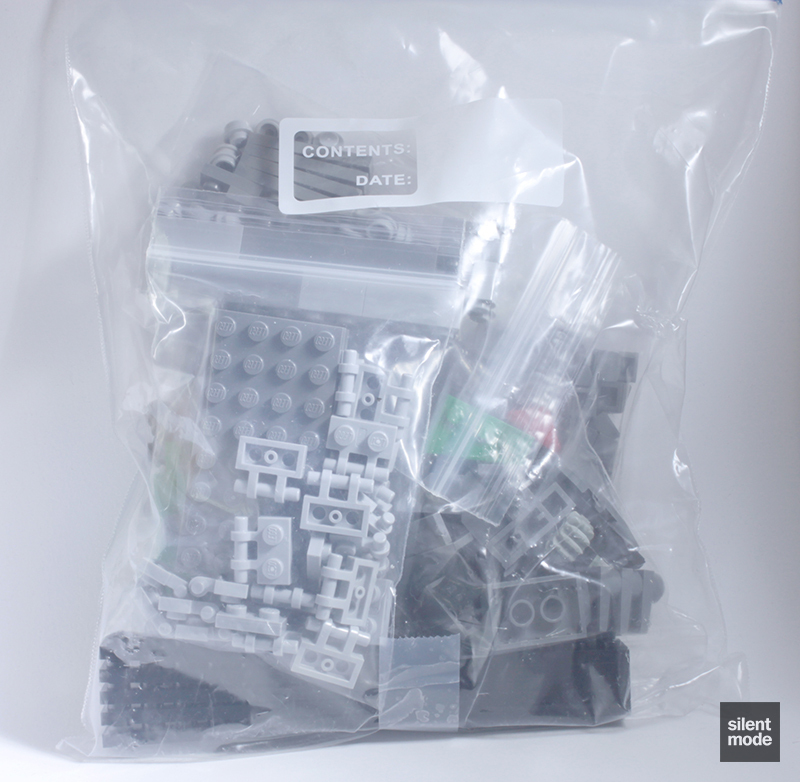 All of the parts required to build the model came in a large Ziploc bag, with most of the parts packaged into smaller bags. I can’t imagine how long it must have taken to sort all these parts for 200 models, and that’s just for this 250-piece set. As you can see, most of the parts are in Light Bluish Grey or Dark Bluish Grey, with the few Green and even Red pieces being very noticeable. You might be surprised to find a large number of these plates, but these will be used to great effect later on in the build. You might also be shocked to see very few brick pieces, including two Light Bluish Grey palisade (“log”) bricks. We do have a large selection of plates, however. The only parts that didn’t come in their own bag were the 2×16 Black plates, which came stacked on top of each other but spaced just enough to be able to separate them. Another interesting piece making itself known is the 4×4 tile with four studs in Black (part 6179): back in the day these were primarily used for computer screens (with a sticker applied), and even served as the trunk for a limousine. The presence of so many small pieces often means there’s going to be a lot of detail in the final model. I’m always glad to see 2×4 tiles in a set, particularly Black ones. 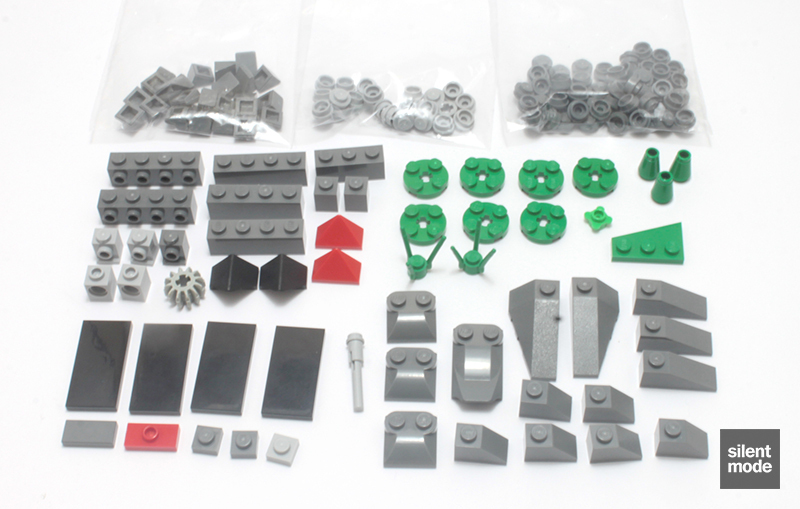 I’m very curious as to what we’ll be doing with the Dark Bluish Grey modified bricks (parts 47457 and 47456 – I don’t know why they’re classed as modified bricks either). Even if you didn’t want to make a sizable pledge to the Kickstarter project, you could get your hands on the instructions for the model(s) you wanted to make as a reward. Rather than include the instructions in the package, they were supplied as a PDF sent by email. This makes more sense, seeing that we are in the digital age, and printing the instructions would have meant more production time and greater postage costs. I mention the instructions because I wanted to show just a couple of pages from the PDF. The instructions divide the model into two parts, and this picture shows the first part. 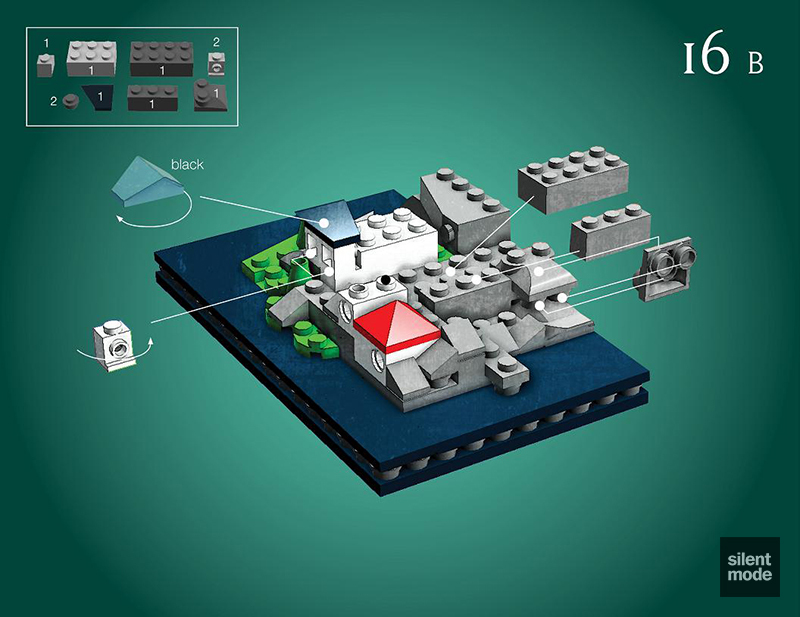 I like that the instructions were created to look slightly different to LEGO’s official instructions and what would normally be generated by LDraw/LPub, giving the whole creation a very distinctive look. The opening pages of the instructions – and indeed the logos used throughout – suggest quite a bit of inspiration from Islam and the Middle East. The steps in the instructions show you where to place each element by using lines and dots, as well as which elements are involved in that particular step. Given the style of the picture of the model as it’s being assembled, this method is actually useful – however there were points where the exact positions of parts weren’t entirely clear, because the edges of parts of the same colour were “merged”. Fortunately you’ll be able to identify any mistakes (which will mostly happen during the first part of the build) before it’s too late, and without having to destroy everything. Those five 2×16 plates are used to make the base of the model, giving us a 10×16 area to work with. They will be held together by the large Dark Bluish Grey plates. The majority of out Dark Bluish Grey “stud” pieces will outline the base, purely for aesthetics. On top of everything, the 4×4 and 2×4 tiles are used to form a smooth surface, with the rest of the model built on top of it. Here we’ve really gotten into the build and started building the coast surrounding the tower. So far we can tell the Green cones are being used as trees, while the longer modified brick from earlier seems to be a rock formation of some kind. Very interesting is how the wedge brick (at the top) is being held by a 1×4 SNOT brick: let’s find out how it fits in with the overall design. At the end of the first half of the build we’ve built on top of everything some more, and now we can see a couple of houses and even more rocks. The house in the middle (where the two palisade bricks are) was a little tricky, mostly due to the Black roof brick initially facing the wrong way: one of the issues brought up by following the instructions. 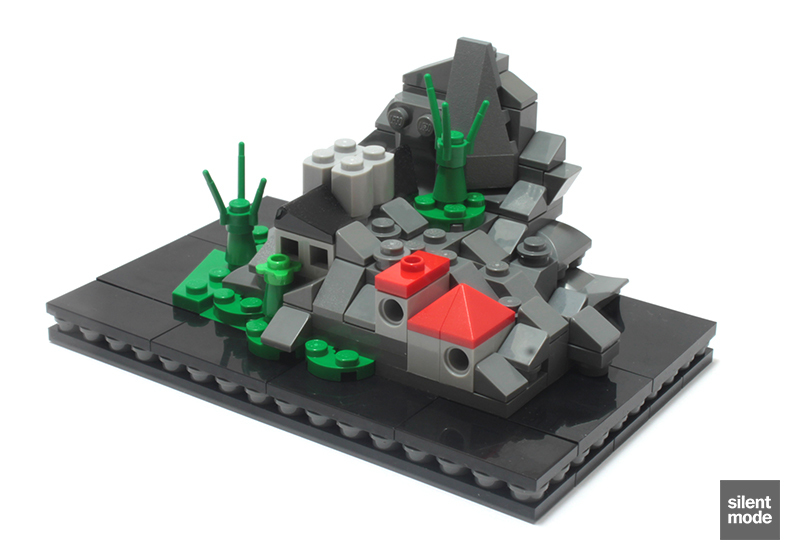 At the end of it all we have a very nice microscale coastal scene, complete with rock formations, houses and trees. On its own it should give newcomers to microscale building a good idea of some of the techniques they can use. 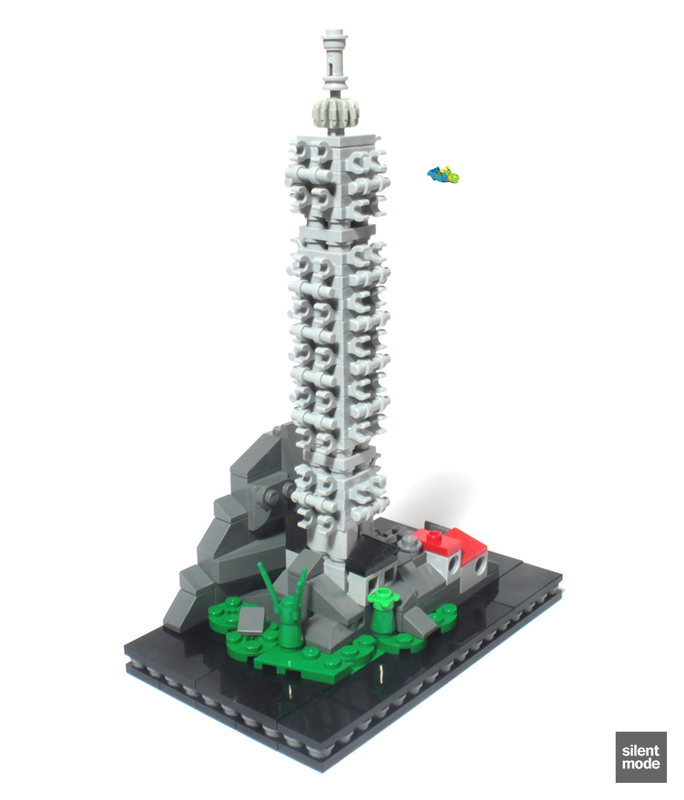 The second and last part of the build is the tower, which many of us would have paid the most attention to when seeing this model for the first time. It’s not a difficult thing to build, but be prepared for quite a bit of repetition. These are the bits you’ll have to build several times to make the tower, hence why we were provided with so many modified plates. If everything was done correctly you should now have a large stack of plates, as pictured above. 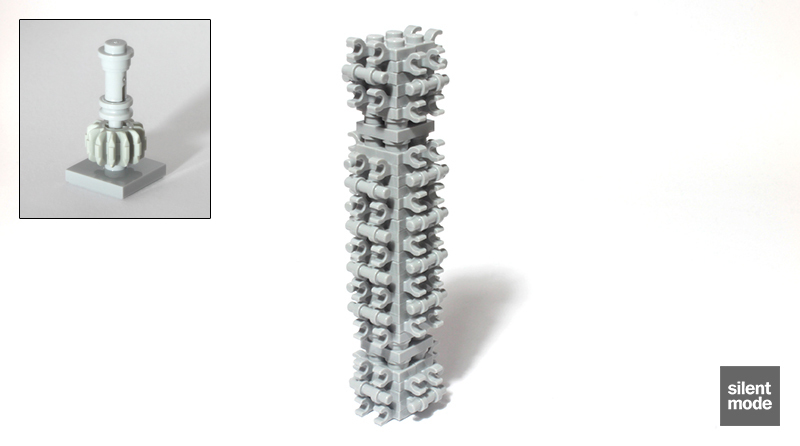 The only thing left to do is make the tower’s spire, which is made possible with the last few remaining parts (left). 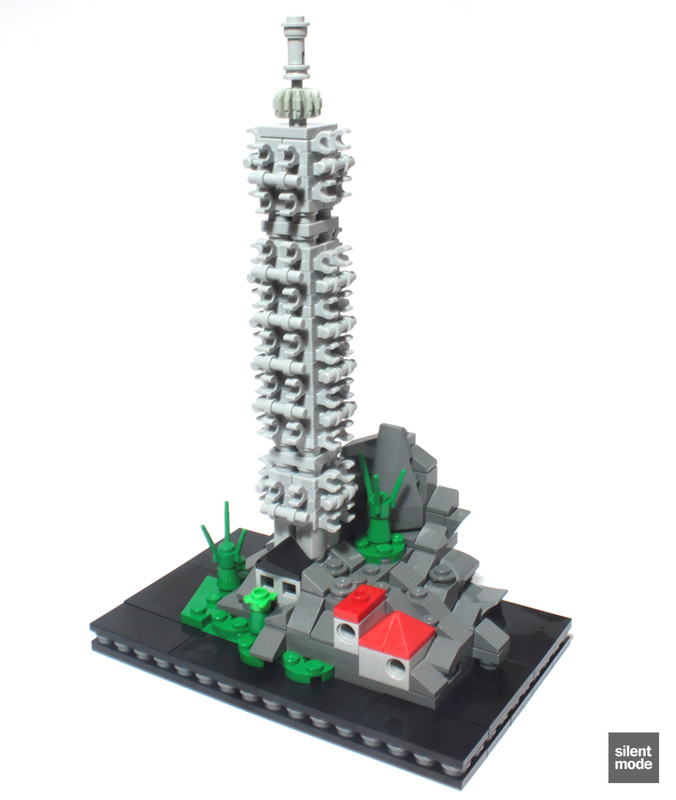 Sit back and admire about 20 minutes’ worth of building (assuming you don’t have to take photos!). Imagine this model on your desk at work, and how much conversation – wanted or unwanted – it will generate. Despite the number of small pieces provided, one thing to bear in mind is that there aren’t any spare parts. 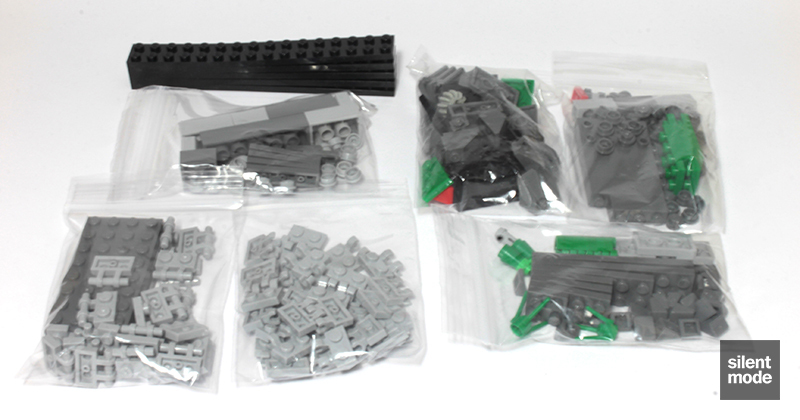 However, many of the parts used in this set can be found in polybags, and any spare LEGO store monthly build sets. For the sake of clarity, this review is about this particular set offered as part of the CONTACT 1 project, and not the project itself. Objectivity is the name of the game. First of all, this set is great for people who saw the CONTACT 1 build and wanted to take a piece of the action with them, learning some of the techniques in the process. The print offered with the reward I pledged for, as well as the certificate of authenticity, were very nice touches that made the process more worthwhile (and gave me some ideas about any future crowdfunding projects I decide to run). 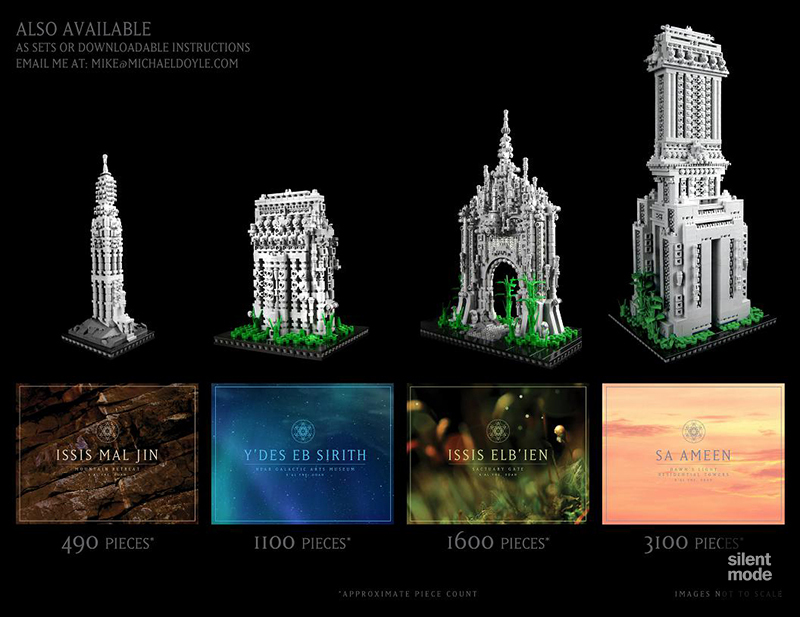 It’s also a great set for people interested in either Architecture sets or microscale building, as not only does it show you some useful building techniques, but it makes use of some otherwise useless pieces, such as the tower almost completely constructed out of modified plates (and in my book, the “modified bricks”). The building itself, for me personally, was the most attractive out of the sets that were offered, and I’d have no problem displaying it on my desk (or if I were an employee, at my work desk) as something to look at and give me inspiration. With so much emphasis online on large models using thousands of pieces and looking uber-realistic, it’s nice to know that microscale models are slowly coming into their own. If I had to put on my know-it-all nitpicking cap, the only thing I’d comment on is the instructions, particularly the pictures used for the model while building it. 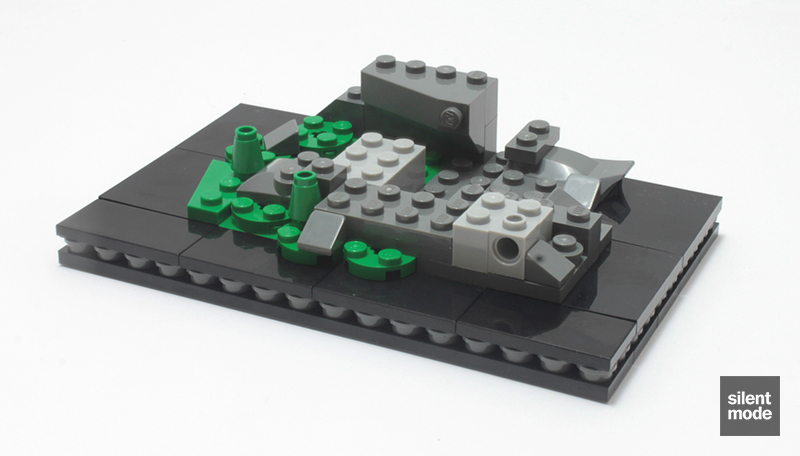 Those new to building microscale may have a challenge deciphering the placement of certain parts, either because of seams between parts not being visible, or in some cases the parts having to go “behind” already placed parts. I can tell it was an artistic decision to show the model in that style, but it also introduced some confusion as to what colour parts were being used: Dark Bluish Grey looks a lot like Light Bluish Grey, and Light Bluish Grey looks a lot like White! However, the parts are shown in the correct colours in the bill of materials for each step, and most of the time there’s only one possible option, given that many of the parts are only provided in one colour. Having had some experience with designing my own instructions, I can tell you it’s not an easy process to decide which parts go first, especially with SNOT builds. My rating for this particular set would translate to 8.0 out of 10, based on the building experience, the model itself and the reward package. Obviously I haven’t built any of the other models, but if you liked CONTACT 1 I would recommend starting your own microscale adventures with this set. If you didn’t back the Kickstarter project, shame on you. However, you may be able to obtain the instructions – and perhaps a limited edition set – by contacting Mike. That’s all for this review, and to round things off here’s a S10 Skydiver doing some BASE jumping.